I have added this page in order to make postings of articles or notices that are not original from this author. These articles are mostly related to the “Mosque Invasion” and will be primarily from Alec Rawls (Crescent of Betrayal-author) whom I recognized in my “Flight 93” article. Alec did most of the “Crescent Memorial” research that I included in that story and has asked that I include his “Blogbursts” on my site in order to reach more people. His information checks out and I am pleased to be included in his network. You can help by passing this link on to your contacts and also by visiting Alec’s site by clicking “ErrorTheory” on my blogroll and checking him out. The original Crescent of Embrace design for the Flight 93 memorial (left) was laid out in the configuration of an Islamic crescent and star flag (right). The crash site sits between the tips of the giant crescent, in the position of the star on an Islamic flag. 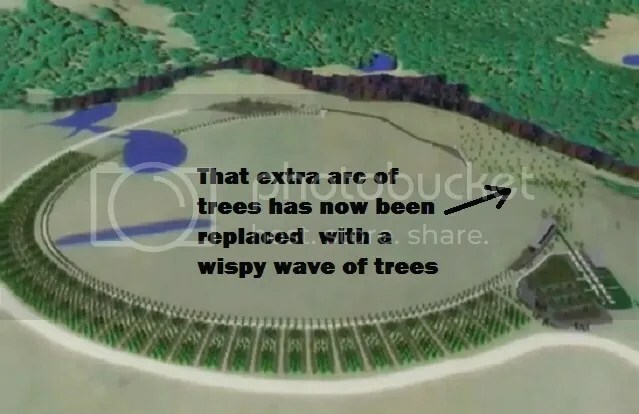 The most significant change is the few extra trees that are being planted outside the mouth of the original crescent (starting at the crescent tip on the right, where the flight path symbolically “breaks the circle,” and continuing down behind the Sacred Ground Plaza that marks the crash site). These few trees supposedly turn the crescent into a circle, but as you can see, they do no such thing, but only apply the most minor window dressing to what is still a bare naked Islamic-shaped crescent. The actions depicted in the memorial design are those of the terrorists. They break the circle of peace and the result is their flag planted atop the graves of our murdered heroes. Calling the design a broken circle instead of a crescent does not change this symbolism one whit. The unbroken part of the circle is still a giant Islamic-shaped crescent, still pointing to Mecca. Left: the Mihrab of the Prophet, at the Prophet’s mosque in Medina. 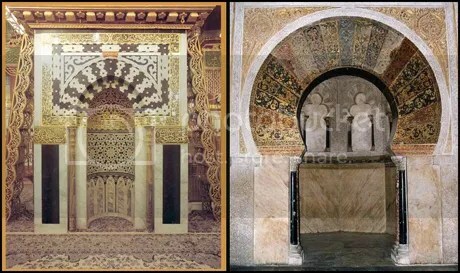 Right: the mihrab of the Great Mosque in Cordoba Spain. Face into these crescents to face Mecca, just as with the Flight 93 memorial. As the Crescent of Embrace was originally designed, a person standing between the tips of the giant Crescent and facing into the center of the Crescent would be facing a little less than 2° north of Mecca (proof here). This almost-exact Mecca orientation was confirmed to the Park Service in 2006 by Daniel Griffith, a professor of “geospatial information” at the University of Texas who was brought in as a consultant by the Park Service. Griffith’s report examined the analysis of Politicalities blogger jonathan Haas, who had calculated that the crescent pointed.62° off of Mecca. Allowing some margin of error for the exact coordinates used for the crash site and for Mecca, Griffith confirmed Haas’ calculation of the direction to Mecca (“the arctangent value is correct”), and he accepted Haas’ calculation that the bisector of the giant crescent pointed a mere .62° off of this Mecca-line. The actual divergence is slightly larger—a bit less than 2°—but this is what the Park Service was told by Griffith: that the crescent pointed less than 1° from Mecca. Even the Park Service realized this was bad but their response was pathetic, as Murdoch was only forced to make a slight change in the orientation of his giant mihrab. The conversation is easy to imagine: “How about if I change the orientation by five degrees?” Murdoch presumably asked. “Would that be enough?” So now instead of pointing 2° north of Mecca, it now points 3° south of Mecca, both of which are highly accurate by Islamic standards. For most of Islam’s 1400 year history far-flung Muslims had no accurate way to determine the direction to Mecca. (Many of the most famous mihrabs point 10, 20, 30 or more degrees off Mecca.) Thus it developed as a matter of religious doctrine that what matters isintent to face Mecca, which architect Paul Murdoch proves by elaborately repeating his Mecca orientations throughout the design. Because this extra arc of trees explicitly represents a broken off part of the circle it in no way alters the circle-breaking, crescent-creating theme of the design. Neither does it affect the Mecca-orientation of the giant crescent (the unbroken part of the circle) that is left standing in the wake of 9/11. It only looks like a real change, but the Memorial Project apparently decided that even this purely cosmetic alteration conceded too much to critics. These few trees, planted to the rear of a person facing into the giant crescent, do not diminish in any way the crescent’s functionality as a mihrab/Mecca-direction indicator. You can plant as many trees behind a mosque as you want. It is still a mosque, or in this case, a terrorist-memorial mosque. Feel like complaining? Give Flight 93 Memorial Superintendent Keith Newlin a piece of your mind (and please pass along any response that you receive). There is also a petition you can sign, if you haven’t done so already. Alec Rawls, who has been working with Tom Burnett Sr. to stop the Crescent of Embrace memorial to Flight 93, explains the circumstances (related by Mr. Burnett in 2008, but not published until now). This extreme level of conflict on the jury over perceived Islamic symbolism should have come out years ago. The jury included a designated, non-voting, minutes taker. This was not supposed to be a private deliberation. These were volunteer citizens, doing the people’s business, and the jury minutes were supposed to be made available to the public. The Memorial Project and the Park Service claim that the minutes were “lost.” No doubt, but that doesn’t mean the loss was accidental, and defenders of the Crescent design had good reason to make the minutes go away. Any faithful record would have been explosive, revealing these fierce objections from multiple Flight 93 family members to the blatant Islamic symbolism in the Crescent design. The ballot wasn’t supposed to be secret either, but the Park Service refuses to account for what they claim was a 9 to 6 tally in favor of the Crescent design. What does 9 to 6 even mean on what was a ranked vote amongst three designs? Did every ballot that did not rank the Crescent last get counted as a vote in favor? The whole thing is fishy, and there is one most obvious reason why the defenders of the Crescent might want to keep the vote details hidden. The seven family members on the jury were outnumbered by eight academics and design professionals. Thus all six of the votes against the Crescent could have come from the kin, with only Sandra Felt voting for it. This is more than just possible. It is likely. Another mother of the murdered said only that she agreed with Mr. Burnett, and he thought that the other two men amongst the family members (Gerald Bingham and Ed Root) were on his side as well, though both have since spoken out against his ongoing effort to rescind the chosen design. Bingham and Root are angry at the anguish that the families are still being put through over the memorial design, but could such men have voted for the Crescent in the first place, in the face of that mother’s anguished cry? A vicious left-wing ideologue like Sokolowski, yes, but it seems almost inconceivable that family members could vote for a design that other family members saw as a tribute to the terrorists, or at the very least, as reaching out to Islam. Since Bingham and Root are willing to speak out, can they please tell us whether they voted for the Crescent? If they didn’t, then the vote amongst the family members was at least 5 to 2 against. You may remember that there was considerable controversy when the design for the Flight 93 memorial was unveiled. It was called “Crescent of Embrace.” The crescent is, of course, the central symbol of Islam, and the design apparently was intended to symbolize some sort of rapprochement with that religion. The winning design was chosen by a jury, and some members of the jury, including Thomas Burnett, whose son was one of the heroes who brought down the airplane, vigorously opposed it. As I understand it, no one on the jury questioned the Muslim reference inherent in the crescent, but a majority believed that it would somehow be “healing” for the memorial to be, in part at least, a sort of tribute to Islam. That was John’s response to Tom Sr.’s revelations, and his statement is fully supportable, but for people to know why, the supporting information has to be available to everyone. Now it is. The crescent should be referred to as ‘the circle or arc,’ or other words that are not tied to specific religious iconography. The only question was whether the use of this Islamic symbol shape should be seen as bad, and for a majority to favor the crescent design, a majority just have decided that it wasn’t bad, even in the face of family members who found it horrific. The Flight 93 Memorial selection committee has admitted to misgivings about the word ‘crescent.’ I almost wish that instead they could claim they deliberately chose the crescent design as a gesture of peace and unity with the Islamic world. If they were to make that claim, I would not object. I would welcome such a compassionate gesture. Unfortunately, regardless of the intentions of the jurors, architect Paul Murdoch did not have a compassionate gesture in mind. Mr. Hinderaker’s anniversary post does not investigate whether the giant crescent actually does point to Mecca (allowing it to serve as an Islamic mihrab), or whether the Tower of Voices really is a year-round-accurate Islamic prayer-time sundial. Perfectly understandable, as these claims take some work to check and John had only just learned that the memorial controversy is still aboil, after thinking that it had been resolved in 2005. But he does provide links to the evidence, and notes that some of it is accessible just by looking. Like why in the world does the Tower of Voices have an Islamic-shaped crescent on top? The minaret-like Tower of Voices is formed in the shape of a crescent and is cut at an angle at the top so that its crescent arms reach up to the sky, as seen on mosque minarets across most of the Islamic world. Literally dangling down below these symbolic Islamic heavens are the symbolic lives of the 40 heroes. This symbolic damnation is repeated over and over in Murdoch’s design. The memorial is not just any mosque, it is an al Qaeda victory mosque. So much for trying to reach out to Islam without bothering to vet what part of Islam is being reached out to. Nothing could be worse for the decent people of the Islamic world than to hand a great victory to the very worst in the Islamic world. That is the problem with doing this Muslim-outreach thing on the sly. Knowing the American people would never go along with intentional Islamic outreach, the Memorial Project had to cover up what actually went on in the jury room, and once they got into cover-up mode, they just kept covering up revelation after revelation about what is actually contained in Murdoch’s design. Sokolowski knew that family members on the jury had taken that exact same “disgusting and repellent” view because he had said as much to their faces, and now here he was pretending that it was McRae, not himself, who was vilifying the families. Absolute moral trash of the highest order, even if he is just a feckless little worm. By intent, he is as evil as Murdoch. Gordon Felt, whose brother, Edward, died in the crash, called the focus on the crescent an “unfortunate distraction,” from the fourth anniversary memorial service tomorrow at the crash site. Did Gerald Bingham lie in his letter to the Memorial Project? Please read the following letter into the minutes of the Flight 93 board meeting scheduled for August 2, 2008. I served on the Jury to select the final design for the Flight 93 Memorial along with Mr. Burnett. As I recall, Tom liked the design with a line of rocks along a 2 ½ mile walking trail. 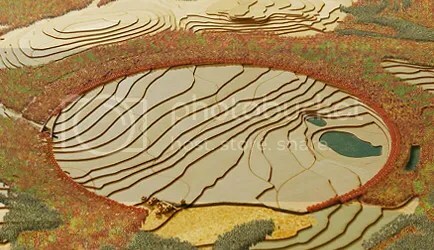 He indicated in his discussion with me that when it came to final vote that this would be the design of his choice. After the vote was taken and his design was not chosen he was very upset. Not once during these discussions did he mention that the design chosen by a majority vote of the committee had anything to do with a “symbol to the terrorist” as he is now saying. 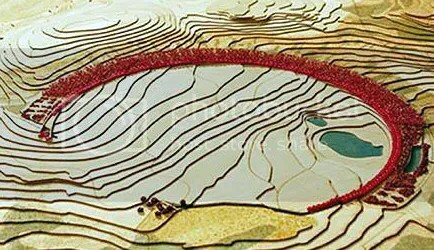 The final design was chosen because its’ layout fit the landscape where the plane crashed and kept with the surrounding area. I believe that Mr. Burnett has forgotten that this memorial is for 40 individual people who were on a flight taken over by terrorists and that all 40 of those people became heroes that day. All he is accomplishing at this point is causing other families aggravation and needless controversy. We need to forge ahead with the plans as voted upon and join together as one just like our loved-ones did on United Flight 93, September 11, 2001. Tom Burnett Sr., whose son died in the crash, said he made an impassioned speech to his fellow jurors about what he felt the crescent represented. But his fellow jurors — and it turns out, many of the other family members — disagree with his interpretation. But not entirely. The jurors, in their final report, suggested the name of Murdoch’s design be changed from crescent to something with less religious significance, like an arc or circle. Fried said the connection was raised by some history buffs on the jury during three days of deliberations last month. Compare “old time Islamic symbol,” with “history buffs.” And if the Jury’s statement that the Crescent name is “tied to specific religious iconography” was not in response to Mr. Burnett’s protests, where did it come from? Is Bingham saying that others on the jury were more vehement than Mr. Burnett in pointing out and objecting to this tie? Then there is Mr. Burnett’s account of Tom Sokolowski calling him “asinine” for objecting to the Islamic symbolism of the crescent. This is corroborated by the fact that Sokolowski used the exact same language to condemn Pastor Ron McRae. Altogether, the evidence is overwhelming that it is Gerald Bingham who is lying when he accuses Mr. Burnett of lying. All he is accomplishing at this point is causing other families aggravation and needless controversy. If Bingham voted for the Crescent, his secrecy about his vote would make no sense. Everyone from Sokolowski on up appeals to the will of the families. Bingham himself does this. These appeals obviously turn on whether the nine votes for the Crescent design came from family members or from the cadre of left-wing design professionals who outnumbered the families 8 to 7. For Bingham’s objective of ending the controversy, the most weighty thing he could say is that he voted for it, but he doesn’t. And how could he have voted for the Crescent? This is a man who is so keen to avoid pain for the families that he is even willing to tell slanderous lies about the one family member he blames for dragging out the controversy. Surely such a man would never have voted in the first place for a design that was already causing the most extreme anguish to multiple family members. Those who oppose this Memorial, for whatever misplaced reasons, have voiced their belief on numerous occasions. That is a striking example of the democracy we hold dear. When those unfounded beliefs turn to a zealotry that attempts to overthrow the very democratic process that selected the winning design it does a terrible disservice to those who worked long and diligently during the design process and, to me, it mocks those very 40 that we long to honor. Our nation is one of laws and due process. To let a few destroy what many have built is not democracy, but tyranny. Yet Root too keeps his vote secret. It could just be embarrassment, not wanting to admit that he voted for such an obvious perversion, crammed to the gills with Islamic-shaped crescents. Or it could be that he was better than that, and despite the magnificence of Murdoch’s Crescent, was unwilling to vote for as design that other family members found so appallingly offensive. That distinguishes the passengers and crew from the hijackers, in Root’s eyes. “[The passengers and flight attendants] wanted to try to get control of the plane and, if possible, to survive,” he said. “But they knew from all of the phone calls that if they didn’t do something, it would be far worse. So it really is this comparison of philosophies of a free society versus a terrorist society. One is, their cause is death; the other is, their cause is life. And that’s what makes this worthy of a national memorial. That’s what makes this worth being remembered. Maybe he can join with Mr. Burnett in demanding an explanation for Memorial Superintendent Keith Newlin’s claim that it was the passengers and crew who crashed the airplane: “They are the one’s who brought the plane down,” says Newlin. This is his way of avoiding the implication that the circle-breaking crescent-creating theme of the memorial can only be depicting the actions of the terrorists. “[The terrorists] TRIED to break the peace,” says Newlin, “but they failed.” Surely Root would disagree. But Root is wrong about who is refusing to respect democratic principles. Their 15 person jury does not take precedence over the will of the nation, clearly expressed in the national uproar over the original Crescent of Embrace design. The Memorial Project promised to remove the offensive features—the Islamic symbol shapes—but they never did. They just disguised them. Crescent of Embrace, left. Circle of Embrace, right. They call it a broken circle now, but the unbroken part of the circle, what symbolically remains standing in the wake of 9/11, is just the original Crescent of Embrace. All they did was recolor the graphics, then add an extra arc of trees, placed to the rear of a person facing into the giant crescent, that explicitly represents a broken off part of the circle. As a result, Murdoch’s circle-breaking crescent-creating theme is now even more explicit, and so are its obvious terrorist-memorializing implications. Will other front-line conservative blogs and publications take notice? John Hinderaker is a top lawyer, a lifelong expert at evaluating evidence. When he announces that there is serious substance to the Flight 93 controversy, serious people ought to listen. Everybody understands the difficulty. With multiple Flight 93 family members crying their anguish against anyone who prolongs the controversy, people need to actually look at the facts before taking a position. So take a look! MANY of the facts are perfectly straightforward and utterly damning. Not everyone can be as brave as Pamela Geller, but no one should let the whiff of danger stop them from examining this most important issue. We’re talking no less than the re-hijacking of Flight 93 by an actual al Qaeda sympathizing architect. Think 9/11 folks. The whiff of danger should be an attractant, a chance to tackle a hijacker. Those lied-to and in some cases lying family members need to have their fat pulled out of the fire. Ride to the sound of the guns. any direction to face Mecca”). such a transparently ludicrous excuse. telling easily verifiable lies will be more up their alley. He said you can face anywhere to face Mecca. such thing as a direction on planet earth? more degrees away from Mecca and it matters not one whit. truth, but whether their intent is to advance Islamic conquest. fact-check our easy-to-verify claims is part of the problem. that would be a fitting memorial to Flight 93. They call it a broken circle now, but the unbroken part of the circle, what symbolically remains standing in the wake of 9/11, is just the original Crescent of Embrace: a giant Islamic-shaped crescent, pointing to Mecca. The damned thing is actually an al Qaeda victory mosque, with the Mecca-oriented crescent as its mihrab: the Mecca-direction indicator around which every mosque is built. That is the short version of an advertisement that started running in western Pennsylvania newspapers last week. Alec Rawls sends along this update on the effort to stop the crescent mosque. 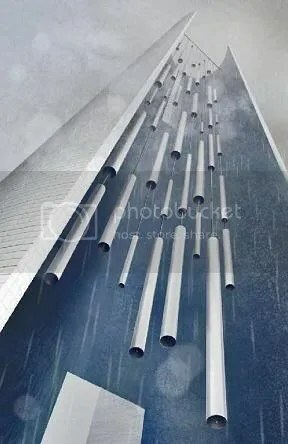 The Pittsburgh Tribune-Review recently solicited Tom Burnett Senior’s response to some new design images for the Flight 93 memorial. When he said that the so-called redesign leaves all of the terrorist memorializing features intact, editors instructed reporter Kari Andren to leave his remarks out. They preferred un-interrupted praise from the same few family members who always speak up for the broken-circle design. The people of Pennsylvania deserve to see what their information gate-keepers don’t want them to know, so Mr. Burnett and his backers decided to begin their 10th anniversary ad campaign a few weeks early. The first full-page color ad just ran in the Somerset Daily American and will appear in two other local papers next week. For a PDF of the ad copy, click on the thumbnail below, or scroll down for the same content formatted for browsing. If anyone wants to help fund additional advertising, a very generous soul has offered to match all donations up to a total of $5000. More explicit than a giant Islamic crescent-and-star flag? 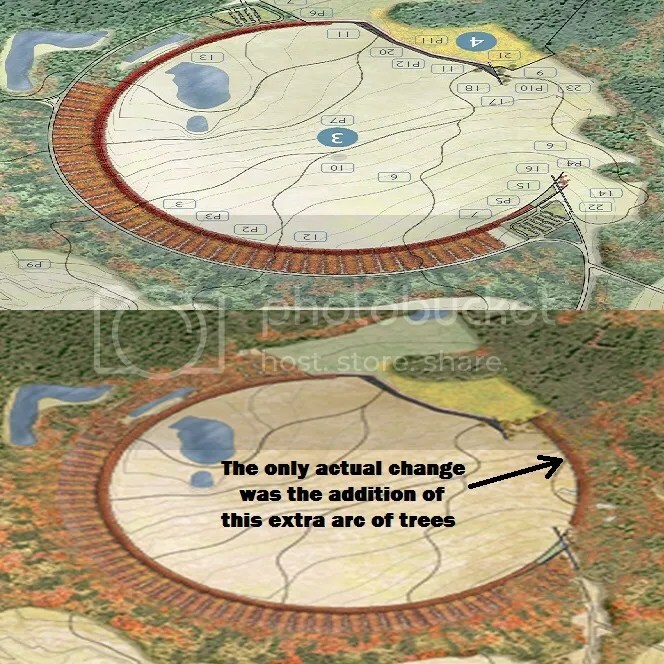 The only visible change is the addition of an extra arc of trees that explicitly represents a broken off part of the circle. The unbroken part of the circle, what symbolically remains standing in the wake of 9/11, is just the original Crescent of Embrace: a giant Islamic shaped crescent, still pointing to Mecca. People also need to know that a Mecca-direction indicator is the central feature around which every mosque is built. It is called a “mihrab,” and the classic mihrab is crescent shaped. … the circle is symbolically “broken” or missing trees in two places, depicting the flight path of the plane, and the crash site. …first, where the flight path of the plane went overhead (which is the location of the planned memorial overlook and visitor center), and second, where the plane crashed at the Sacred Ground (depicted by a ceremonial gate and pathway into the Sacred Ground). These are the two ends of the extra arc of trees, which starts near the original upper crescent tip and continues down to the crash site. So Mr. Burnett is right. Both ends of the new arc of trees are explicitly broken off. The unbroken part of the circle—what symbolically remains standing in the wake of 9/11—is just the original Islamic-shaped Crescent of Embrace that the Park Service promised to change. What the Circle of Embrace actually looks like. The original giant crescent still sits naked on an open field and the flight path still “breaks the circle” at the upper crescent tip. 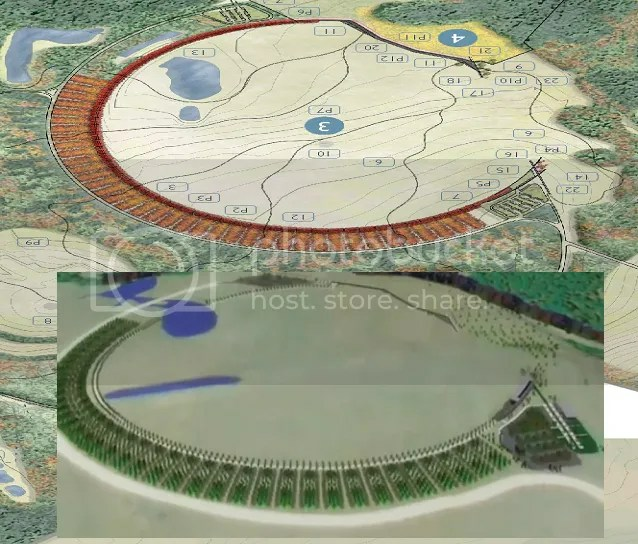 Remove the explicitly broken off part of the circle (in orange), and what symbolically remains standing in the wake of 9/11 is the same giant Mecca-oriented crescent the Park Service promised to change. It constitutes a classic “mihrab,” the Mecca-direction indicator around which every mosque is built, and will form the centerpiece for the world’s largest mosque. Who broke the circle of peace on 9/11? When the “Crescent of Embrace” was unveiled as the winning design, architect Paul Murdoch explained the crescent name and the crescent shape by saying that the circle was broken on 9/11, leaving only a part of the circle still standing: the giant crescent. The fact that this circle-breaking crescent-creating theme remains completely intact in the broken-circle design demands the question of WHO is being depicted as breaking the circle of peace on 9/11. If you want to put a few up yourself, click the image above for a printable PDF, complete with urls for our petition to stop the memorial and for more information. And here is an ad-copy version that anyone can run in their own local paper (the free weeklies can be pretty reasonable). As Flight 93 showed, just because the hijacker has control of the cockpit doesn’t mean he can’t still be stopped. Conservative hero Alan Keyes is asking whether there is a pattern of submission surrounding the nation’s 9/11 sites. Apparently he has seen our video expose of Islamic and terrorist memorializing features in the crescent memorial to Flight 93 (now called a broken circle). Like any straight-thinker, he doesn’t like what he sees. The Flight 93 crash site is no place for a giant Islamic-shaped crescent, no matter what it is called. Keyes notes our claim that the design is still replete with terrorist memorializing features and he seems to find it credible. Why shouldn’t he? The damning features are all right there in architect Paul Murdoch’s design drawings. Thank you Doctor Keyes! Anyone live within driving distance of Somerset Pennsylvania? It’s a beautiful place to visit and a group of motorcyclists from Indianapolis is already going. That’s right. With Laura Bush and Michelle Obama both attending, it’s going to be a media circus, and a rare opportunity to force coverage of our issue. Just self-organize. Ad-holders will show a core of united opposition (and the media might even be forced to read our brief expose). If you haven’t been to Shanksville before, there really is no lovelier place on earth than an open field in that sprawling Sherwood Forest that is Western Pennsylvania. Drink it in. There is something in the air at that patriots’ grave. To join our blogburst against the crescent mosque, just send your blog’s url.